Every year at Burning Man is the same, I always leave swearing that I’m never coming back. Then the tickets go on sale 5 months later and I figure I should get one ‘just in case’ I decide to go. By the time the event rolls around I figure I already have the tickets and I’ve read the email newsletter 100 times so I might just as well go. 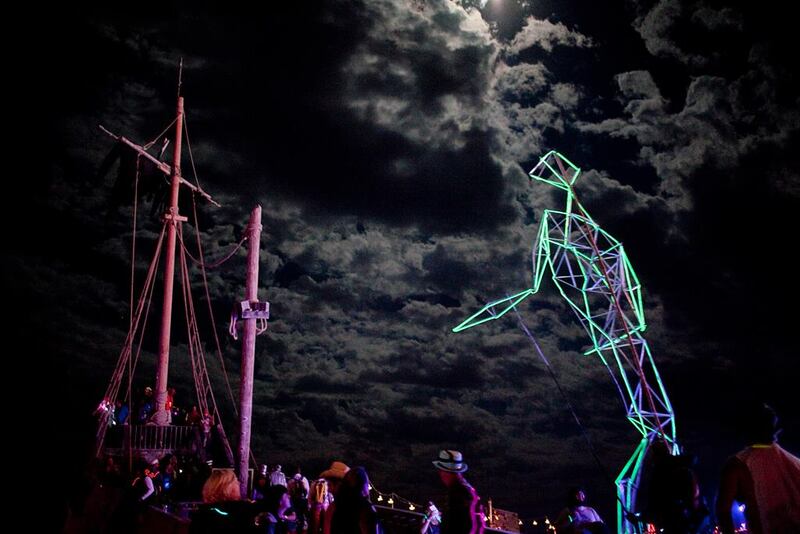 The last several years I’ve built EL-Wire man puppets that were less than 24′ tall and wandered around the playa for countless hours by myself. This year my heart was set on building one that was over 40′ tall, but I had no idea how I would do it. I got home from Canada after 3 weeks of camping with my son and had a total of one day to pack for burning man. I packed everything I needed and my backpack was only half-full so I decided to bring all my EL wire and tools so I could make my dreams become reality. As I packed everything I was left with the sealed AGM Lead-Gel car battery which was too heavy to go on my checked bags, so I decided to bring it with my carry-on luggage, the resulting conversation with the airport security was quite hilarious. I could tell the x-ray machine was stopped and the security guard was staring intently at the screen trying to figure out what my battery was. I told her “I’ll give you three guesses what it is”, but alas Homeland Security are far too well-trained and immediately knew it was a car battery. When they asked what I was using it for I told them “You’ll never guess in 1,000,000 years”. They seemed pretty excited when I told them I was building a 40′ tall lighted puppet in the desert. At the time I didn’t even know if I COULD do it, but it made for a pretty good story. Like most things in life once I started talking to people about what I was doing, I had to go ahead and do it. The flight was mostly uneventful, although I did find myself sitting next to Glenn Grant, a Science Fiction writer who was camping with the Lost Penguin Cafe. He sold me a book of short stories that included a piece about a bunch of futuristic nomads that gathered in the desert for a festival that he wrote long before Burning Man was ever relocated to the Black Rock Desert. When I arrived at Reno I had no idea how I was getting to Burning Man and I had arrived about 18 hours before the gates opened. I plugged my car battery into the outlet to charge and fell asleep. I awoke from my slumber to the bomb squad and the airport security guards investigating my battery. I was so irritated all I could say was ‘It’s a car battery plugged into a charger’. The police seemed to agree with my assessment of the situation and we both just kind of looked at the airport security guard with confusion to which he just shrugged off. After that incident I wandered outside with my stuff convinced I would get a better night’s sleep in a ditch somewhere without the lights and loudspeaker at the airport. I found a plush green lawn about a half a mile from the airport and blew up my air mattress and climbed in my sleeping bag to go to sleep. As I was dozing off I thought of how perfect it was that I was there in Reno, sleeping under the stars. Just as I was dozing off I heard a repeating clicking noise and was suddenly getting covered in water. Tiny hidden sprinklers had popped up all around me and were doing there part to keep the grass nice and plush. I covered the nearest sprinkler with my hands and desperately shoved all my belongings into my backpack as I ran back to the airport. I layed down at the airport with my wet sleeping bag over my head and fell back asleep to the sound of really bad anti-burner musak. After several misadventures and 3 different promised rides to BRC I ended up outside the airport on the lawn reading by myself for several hours. A Ranger named Painless picked me up in his ratty camper as he was trolling for burners to bring to the Playa. He dropped me in Gerlach and I sat for 6 hours watching the freak-show go by. Everyone who arrived early was confined to the D(etention) lot so we carefully planned to leave so we would arrive at the gate right at 6:00 PM. Our entrance into the city took only about 80 minutes which was by far the shortest time I have ever waited. This would be karmically countered by an exodus while leaving of over 7 hours in line on the way out. I rode into BRC with a really nice German guy who came all the way to Burning Man by himself dressed in a white polo outfit with that perky Burgin (Burner Virgin) excitement that frequently is so contagious. This was my first year camping with a big theme camp and Rhythm-wave at 4:15 and Biggie was the best place I have ever found on the Playa. The people were amazing, the food was some of the best I had ever eaten and we had the only bamboo dance floor on the Playa which was frequently packed with people doing Yoga or dancing. Rhythm-wave is an Intentional Dance Community based around the 5 Rhythms, and the people there were serious about the healing power of dance. For the first time ever after what seems like countless burns, it felt like the only place I’ve ever found at BRC that felt like home. This was also my first time there in many years without my son who opted out of going last year, it was strange to be free of my fatherly responsibilities and the Kidsville camp. I spent 6 hours wandering BRC scrounging for building materials for my puppet. Finally I discovered a bunch of crazy russians at the Atom Cult camp who were building a 30′ tall bamboo tower with a trampoline at the top. Vladimir was amazingly friendly and accommodating and I would never have been able to build my puppet without his donated bamboo. The hardest thing for me to do is to ask for help, but there I was asking strangers again and again for what I needed to make my dreams come true. Most days I danced 4-6 hours on the Bamboo floor then spent the rest of the time working on my puppet. The first time I held up 43′ of Bamboo by myself and tried to stabilize it I was heartbroken. It wobbled so badly that there did not seem to be any way that it would work without a lot of help and stabilization from others that I felt totally awkward about asking for. Eventually I decided on using 2 stick stabilizers that connected about 20 feet up and then 3 more guide wires that were connected to the head near the top. The total weight of the structure was under 70 lbs, but when the wind blew, the people on guide wires would end up holding their entire body weight against the lines thus greatly increasing the weight of the structure on my back. It was hard to communicate with my team, as they all needed to stay 15-20 feet away from me, so I ended up having to bark orders at them to get us all to work together. As the bamboo laid out in the hot sun there was several huge cracks that developed right near the base. I ended up gluing them shut and using metal clamps to keep the bamboo from self-destructing. The entire time I had the puppet on my back I was convinced it would fall apart and kill someone, but it never did. When we went out to see the man burn the Rangers came up to us and instead of saying ‘What are you doing, are you crazy idiot, get that thing out of here’ all they said was ‘please don’t block the ambulances’. Oh how I love Black Rock City. After all 5 of my puppet support team finished walking around the man as he burned we all got together for a game of Flaming Tetherball at my Brother in Law’s camp Plunderground. Hitting the flaming ball on a leash is a lot harder than it looks because as the flaming ball speeds towards your head everything in your mind is telling you to run away screaming. You have to overcome those little voices of sanity and firmly plant yourself right in front of the flaming ball and smack it with all your might to win. There was a lot of cool things at Burning man this year but hands down the best camp was the UFOm camp. It was an Alien invasion preparedness camp that used a lot of readiness brochures and pamphlets from the 50’s. They shuttled you into a huge room with a giant plexiglass cage in it. Keep in mind I had been without a shower in the desert for 5 days when I first visited this camp. They loaded 80 naked people into the cage at a time who were dancing around to a rocking DJ, then they BLASTED you with high pressure foam. I was laughing so hard that my mouth refused to close and the foam literally filled my mouth again and again. Mentally I knew that I should not be ingesting the foam but I was laughing so hard I just could not close it. It’s hard to accurately describe the feeling of dancing excitedly with 80 naked complete strangers while covered in foam. It wasn’t weird or sexual, it was just pure, raw fun. In a world full of weird sexual insanity, it seemed the least sexually charged part of Burning Man, and totally natural in a very strange way. It was hard saying goodbye to the Playa. When it came time to strike camp at Rhythm wave I found myself with a deep sense of newfound comradery with my fellow campers. Over the week we had done more than just survive, by working together we had really thrived. By pooling resources we contributed more to BRC than any of us could ever have done alone. Everything in the camp ran like clockwork, the Compost, the Greywater, the Kitchen, the dancefloor, but not without a lot of time, effort and love poured in. It was the first year I’ve ever left and wanted to come back. That really is something special. Doug Shire and I had 3 days to enjoy together after the burn before our flights left from Reno so we headed to Yosemite to go backpacking for 3 days. There was a huge wildfire that had started encroaching before we went to BRC and I had no idea of the state of affairs before we left. The park road was closed and we could only drive about 30 miles in from the NE. That meant that Yosemite Valley and Half Dome were not accessible by car, and would require many hours of driving to get to from the SW entrance. After a quick assessment of the situation Doug and I decided that the extra 20 miles of hiking in order to achieve our earlier lofty goal of climbing half-dome was totally acceptable. Although usually this is a very busy time of year at Yosemite, with the fire it was pretty empty in the campgrounds and the trails so we got our permit to climb half-dome with ease. Thank goodness because we had already spent 7 hours in line to get out of Burning Man and I had no interest in waiting in line for a Backcountry Permit. Doug was amazing company, to say he was one of the best travel partners I’ve ever had, was an understatement. No matter what life threw at us his attitude was upbeat and his sense of humor stayed intact. Thanks to everyone from Rhythm Wave, Plunderground and Vladimir from Atom Cult for making my Playa dreams a reality. A very special thanks to Spring, Shantideva, Moop, Hips and Xanthe for helping me navigate the crowds with the giant puppet. It really was the best group ‘art-car’ ever. In the end I only built it because I was convinced that I couldn’t. Can there be any better motivation in this life?